The Commented Bible series is a comprehensive and detailed verse by verse study of the entire Bible. It is designed as a personal, Bible study and group study platform for learning the entire Bible. Each volume covers every Chapter and Verse, with commentary, a wealth of applicable cross-reference scriptures, background material, application to the past and present, with study questions on every paragraph. It covers all of the Bible's illustrations, parables and teachings in depth. Quickly you can become an expert by simply reading the material and answering the simple, but thought provoking questions. 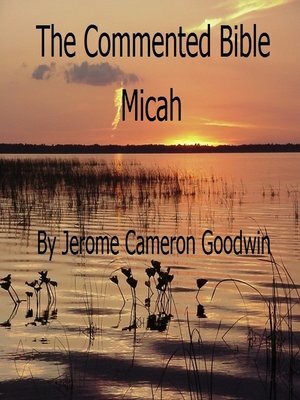 The Commented Bible – Book 33 – Micah, are part of a series of writings on the complete writings of the Bible. This book in the series is Book 33, and it covers the Bible book of Micah, covering every verse, with commentary, extensive cross-references and study questions for each verse. It is 226 pages in length and will serve as a learning tool and continuing study reference throughout one's life. It is a valuable reference for Christians who want to study deeply the true teachings of the Bible, which writings are the basis of all true faith. It is designed for the layman, and does not require any pre-existing knowledge of the Bible to properly understand it. It is designed to be a simple and effective means for anyone who is wanting to know accurately what the Bible teaches to learn it. It includes much documentary and background information on Micah's life, and it makes clear all his teachings, by showing all pertinent cross-reference information from the rest of the Bible record. It was written to bring together Christians into a unity of thought, by bringing together all other pertinent scriptural information in one place for study and meditation. It can be read as a book, used as a reference tool, or as the medium for group studies and open discussions. After reading it you will know the truth, and will be able to express your faith with confidence and accuracy on any part of Micah's writings. God's word is truth! It is also part of a larger work called, The Commented Bible, which currently includes 83 other works covering the books of Isaiah through to the Revelation.